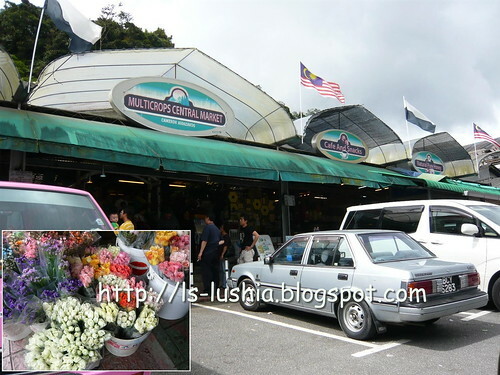 Cameron Highlands is Malaysia's largest hill resort. Standing at an elevation of 1524 above sea level. The highland has a consistent cool climate throughout the year. It was first discovered by William Cameron in 1885 by a British government surveyor during a mapping expedition on the Titiwangsa Range (Perak/Pahang border). Failing to mark the discovery during the expedition, the location of the plateau was confirmed by Sir Hugh Low during the subsequent expedition. Si r Hugh Low suggested that this would be an ideal location for a retreat and farmland. A narrow path to the highland was then cut through the jungles of the highlands. Since then, the plateau remained untouched until 1920s when the narrow bridle path leading up to the mountain was improved. In 1925, Sir George Maxwell visited the mountain and eventually led the development of the hill station now known as CAMERON HIGHLANDS. Next few post will be on those places that I have visited. 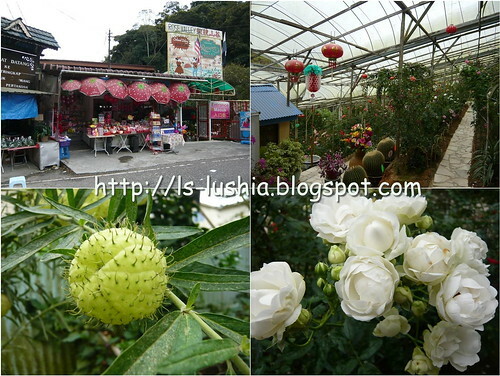 There are just so many accommodations available in Cameron Highlands that and you might not know where to stay . 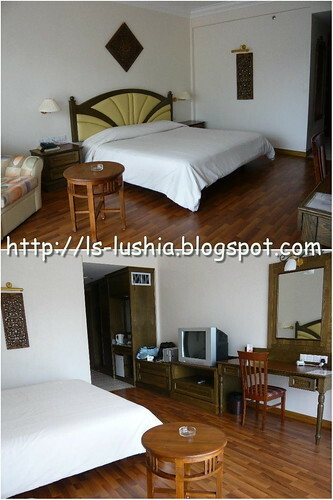 Accommodations ranges from budget hotels, to apartments, service apartments, chalets, hotels and resorts. 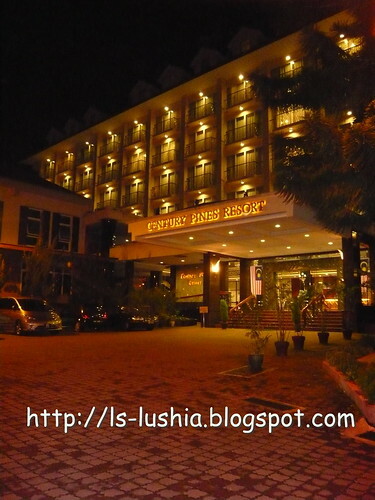 Myself made a reservation at Century Pines Resort at Tanah Rata town particularly because Brinchang town are more crowded as most markets and farms as well as eateries are concentrated at Brinchang town. Might be a liltle jam during weekends or public holidays. 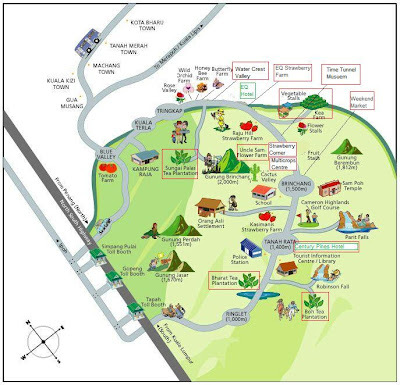 Century Pines Resort, a property of Thong Sin Group is located at Tanah Rata town, which is about 10 minutes drive to Brinchang Town. 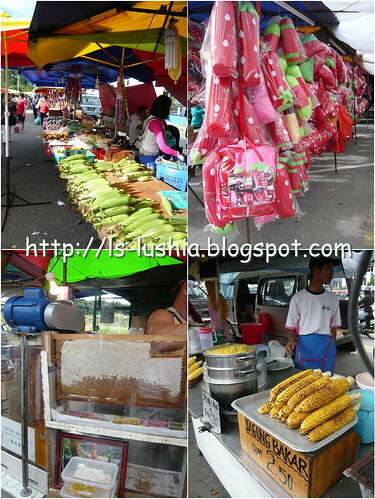 Conveniently located in the midst of Tanah Rata town, right opposite the police station. A trip to Cameron Highlands would be incomplete without a visit to the tea plantation. 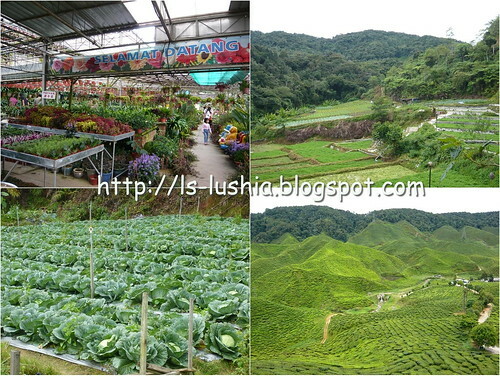 Cameron Highlands is fondly known as the "Giant Green" carpet of Malaysia. 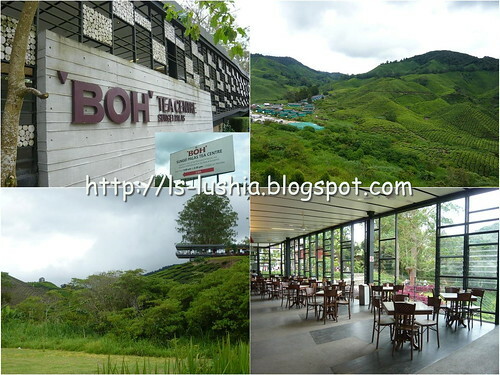 The tea plantations is one of the key attraction of the highland. Routes uphill are rather narrow. While cornering up hill, do give a honk to alert the oncoming car from the opposite direction. 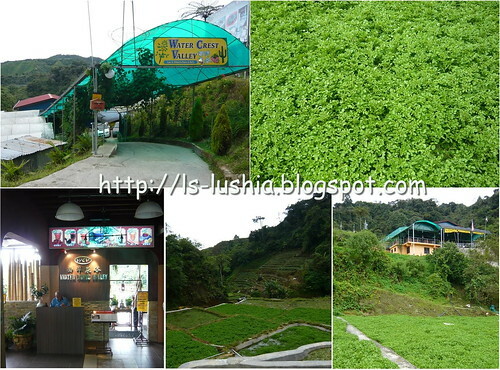 Sungai Palas Tea Plantation would be the most perfect visit. 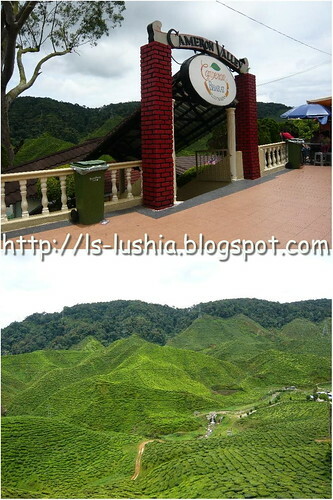 Perfect view with breathtaking and eye soothing green sceneries. 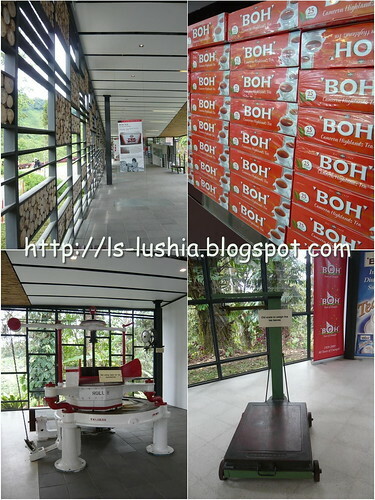 You may want to go for the factory tour provided by Boh Plantation. Too bad.. it's close on Monday. 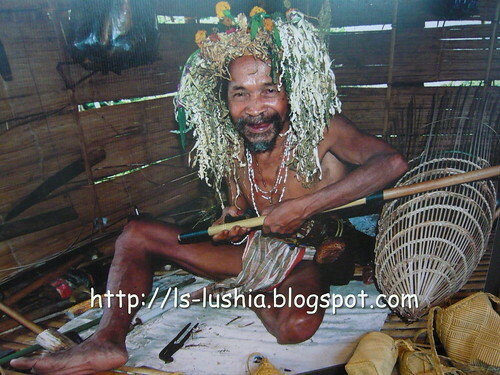 But then again, there is a video room for visitors to watch the videos on tea processing. Both Fairlie plantation and Sungai Palas plantatian has a tea centre for visitors to enjoy a cup of tea while enjoying cooling breeze and the beautiful piece of green carpet sceneries. 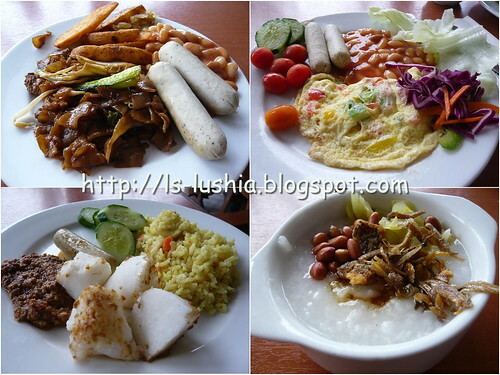 Shouldn't miss the Sungai Palas Tea Centre at all!! It offers spectacular views from a 20 foot overhanging platform. 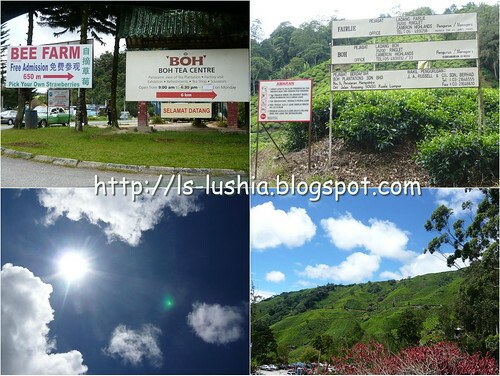 Besides Boh Tea Plantation, Cameron Bharat Plantation is the second largest tea producer in Malaysia. 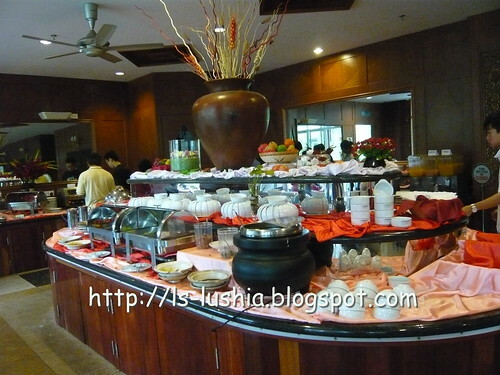 There are two Cameron Valley Tea House between Ringlet and Tanah Rate. Just good enough for one to stop for some stretching after a traveling a long journey uphill. It's an irresistible stopover!! A good stop to refresh yourself and take in the lush view of the tea gardens , relaxingly sipping a cup of freshly brewed tea with a scones or strawberry cheesecake. Bharat Tea Plantation produces highlands tea- a premium quality black tea as well. Remember, tea plantations is a MUST VISIT!! The symbol of love,purity, innocence, sympathy and secrecy. Rose, a flower with long and colorful history. What's you favorite rose color? How much do you know about this flower? 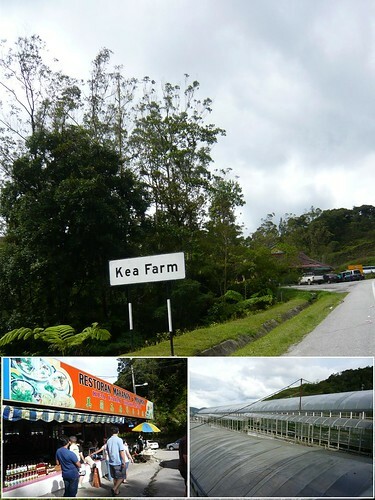 Well, if you are interested to know more, there are two places in Cameron Highlands for tourist to witness how roses are grown- Rose Center@ Kea Farm, Brinchang & Rose Valley @ Tringkap- about 15 minutes drive from Brinchang town. 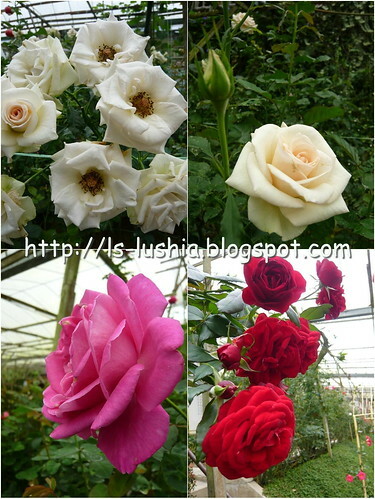 A farm big enough to sight various species of roses in a variety of colors. Rose in full bloom. Carefull!! It pricks!! 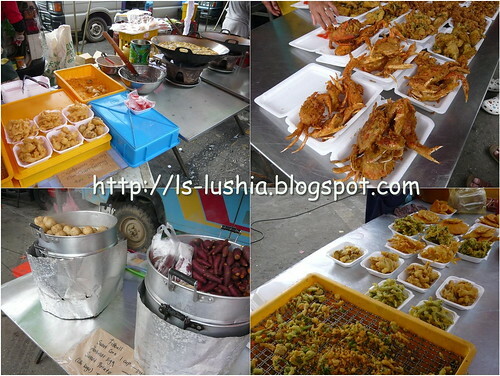 Central Market would be a good place to shop for souvenirs and local products or perhaps a place to stop for a snack. There is a cafe and a landscaped garden in the market. There are tables around the garden and it's a perfect place for a cup of hot drinks while enjoying the colors of the flowers and the cool climate. I mentioned- it's a perfect place for a cup of tea- but definitely not when it is so pack that all tables are taken. 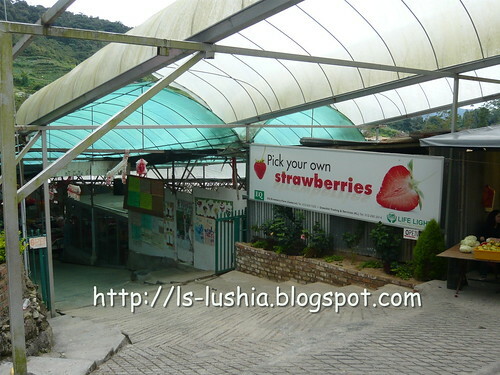 To the left end of Multi crops central market, there is a shop which belongs to Multicrop Central Market known as Strawberry Corner. 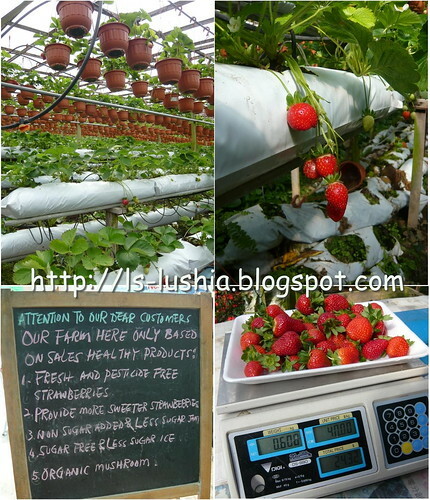 At Strawberry corner, there are lots of local products especially preserved fruits and strawberry jams. You might want to grab a pack or two for your relatives and friends. 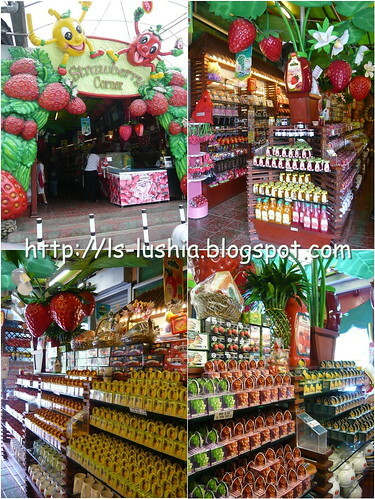 Other than food, there are gifts with strawberry designs too. 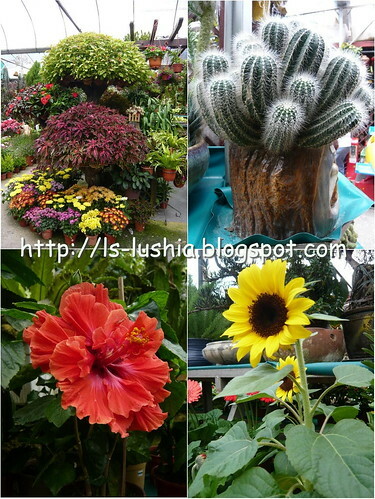 And then, to the right of Multi Crops Central market, there is a flower farm. A pot or two of flower or cactus you? 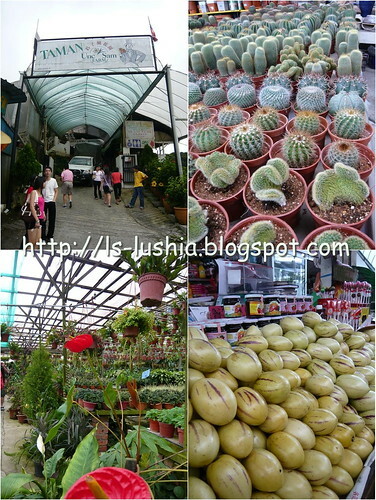 Unc Sam Farm @ Brinchang- pots of cactus & flowers for sale. Grab some cameron apples too! 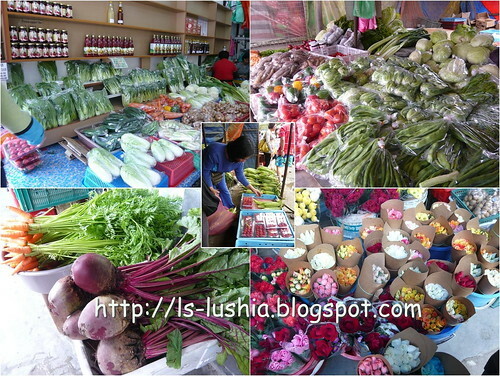 It's one of the latest attraction in Cameron Highlands. A stroll to the yesteryears!! 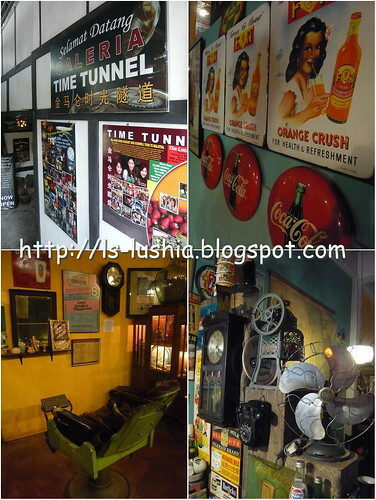 At Time Tunnel, there are lots of antique collections, especially household utensils and old personal collections by the locals. 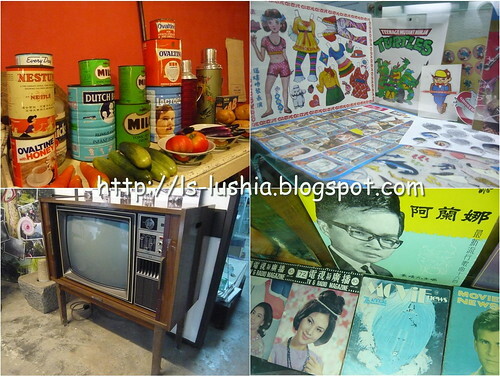 Does some of the collection looks familiar to you?? Yes.... I have seen few of it when I was young!! I love this painting!! What a warm smile!! I enjoyed strolling to the past, experiencing the rustic charm of the unique museum that captures the spirit of Malaysia life. Take a glimpse of heartwarming photos and collections depicting how life was live back then. It brings back good old memories. Will you enjoy it as well?